The Golden State Warriors pulled off a 99-92 win over the Cleveland Cavaliers in the NBA, while the Washington Wizards upset the Boston Celtics. The matchup between the Warriors (27-7) and Cavaliers (24-10) gave some indication of what could be yet another NBA Finals preview. 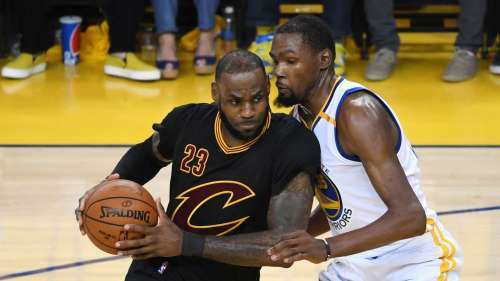 With some of the league's best point guards missing in the Warriors' Stephen Curry (ankle) and Cleveland's Isaiah Thomas (hip), it became a battle between the Cavs' LeBron James and the Warriors' Kevin Durant. In the end, the Warriors were able to pull off a win over the Cavs, and it came down to the last minute of the game. The Warriors started to break away in the third quarter before James tied it up with two minutes remaining. The Cavs could not hold on as Klay Thompson nailed five big points in the last 30 seconds. The matchup certainly lived up to the hype, but not without controversy. In Cleveland's final possessions, Durant appeared to foul James two different times, but there was no call. Durant has been given more responsibility since Curry, who has missed the team's last five games with his sprained right ankle, was sidelined. Durant delivered for the Warriors on Monday, finishing with 25 points, seven rebounds and five blocks. The Cavs were led by James with 20 points, six assists, and six rebounds, with the help of Kevin Love, who had 31 points and 18 rebounds. In Boston, the Celtics played in their first ever home game on Christmas Day, but it did not go as planned in a 111-103 loss to the Wizards. Washington (19-15), ranked number seven in the Eastern Conference prior to the matchup, knocked off the top-seeded Celtics (27-10). Big performances from Bradley Beal (25 points) and John Wall (21 points, 14 assists) gave Boston their third loss in four games. Despite the Celtics taking a 95-90 lead with six minutes, 18 seconds remaining, the Wizards responded with a 12-0 run where Beal landed a three-pointer and a dunk off a turnover while Wall nailed a layup and two free throws to allow Washington to seal it. Knicks center Enes Kanter stole the show at Madison Square Garden, despite a 105-98 loss to the 76ers. It came in a losing effort, but he outshined 76ers counterpart Joel Embiid. Kanter tallied 31 points with 22 rebounds. There have only been five 30 point/20 rebound games in NBA Christmas history with the last one coming in 1971 from Bob Lanier, according to NBA Stats. Russell Westbrook was unstoppable with 31 points, 11 assists and six rebounds in the Thunder's 112-107 win over the Rockets. Westbrook was the clear leader for Thunder, who won their fifth straight game while Houston's losing streak reached three games. Rockets guard Eric Gordon played 37 minutes, the second most to James Harden, but shot six of 13 from the floor and only made three of his seven three-point attempts in Houston's loss to the Thunder. If every player could push through the Wizards defenders like Kyrie Irving did Monday, the Celtics may have been able to pull off the win. Boston were down 71-62 in the third quarter when Irving fought through every Wizards defender and still found a way to score. The Pacers are sitting fourth while the Pistons are number five in the Eastern Conference rankings at this point in the season. This will be the final time the two meet this season, but they have already faced each other three times with Detroit coming in with a 2-1 edge. When the Pacers and the Pistons matched up in their most recent meeting on December 15, Andre Drummond led the way for Detroit with 23 points and 13 rebounds in a 104-98 Pistons victory.